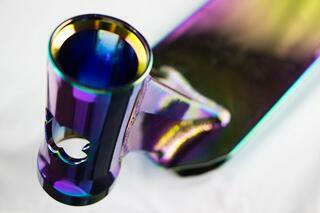 NeoChrome is BACK IN STOCK! 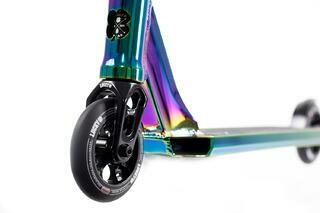 As you can clearly tell based on this rather lengthy list of specifications, the NeoChrome Covenant is simply a remarkable scooter. However, if you aren’t sold on it after examining the list of specs than just take one look at a picture of this beautiful scooter. There’s a reason why this thing is in such high demand, and once all of your scooter friends take one look at this scooter, they’re never going to be satisfied with the look of their scooters ever again. Not only is the NeoChrome simply breathtaking to look at, but also, the artwork on the bottom of the deck is astonishingly gorgeous, as well. These bad boys are moving extremely fast, so if you don’t get yours while they are still in stock than it may be too late. 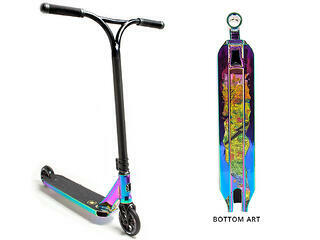 The Lucky Scooters NeoChrome Covenant is currently available at Lucky Scooters for the very affordable price of just $299.99, so be sure to go snag yourself one today. Also, don’t forget that the Covenant complete comes available in Black, Red, and Raw as well, for those of you who are interested in different color options. Anyways, be sure to stay tuned right here at the Lucky Scooters blog for more product reviews and updates in the near future, along with any and all other future Lucky Scooters news and content. Pick yourself up a NeoChrome Covenant HERE!